Enables connection of any USB human interface device - from mice and keyboards through to touch screens, graphics tablets, jog shuttles, joysticks and 3D explorers. Mass storage devices and isochronous devices such as webcams and headsets can also be used. Adder C-USB-LAN extenders are delivered in a zero config state so you can plug the units in and start working with them straight away. When supplied as pairs, they are already synchronized, so they will locate each other automatically over your network. Once connected, operation is totally transparent to the host system, the USB peripheral(s) and you, the user. There are no drivers to install and your USB devices work precisely as they did before; the only difference is that they are now up to 330 feet (100 meters) away from the host. There is no need for drivers or software to be installed. An API is available, supporting all functionality to which authorized 3rd party control systems can interface. With Isochronous support the C-USB-LAN will work with USB microphones and headsets as well as web cams. 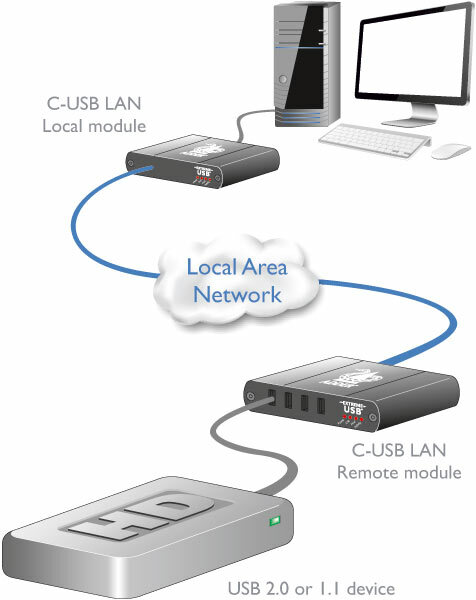 The C-USB-LAN can be controlled and switched via the AdderLink Infinity Manager (A.I.M. ), or it can operate separately, as a point to point USB extender using a single length of CATx cable.